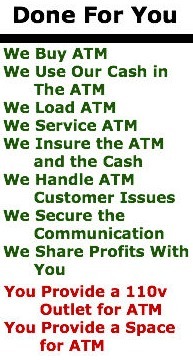 The ATM Ladies Done For You Program is a 100% hands off system for you, the business owner. We understand that you are a business owner and you are busy running a successful business. Our Done For You Program allows you to continue running your business while adding a convenience for your customers and an extra revenue stream for your business. We often have business owners ask us “What’s the catch?” when speaking about our Done For You Program. There really is no catch. All you have to do is provide us a space to put the ATM in and point us to the nearest 110v electrical outlet and voila! After the ATM is set up, people will start using the ATM and we will start sending you a profit sharing check once a month. No strings attached. Promise.